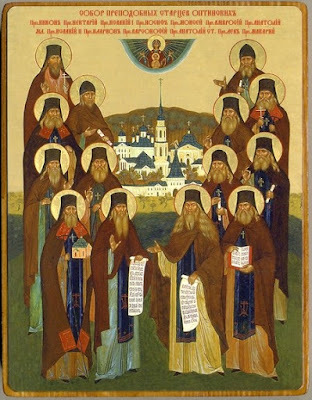 The commemoration of the Synaxis of the Venerable Elders of Optina was instituted by the Patriarchate of Moscow in July 1996 to be celebrated on October 11th. 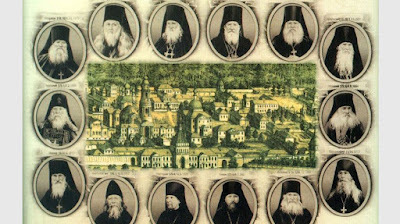 The fourteen Holy Elders celebrated are: Saint Leonid (October 11), Saint Macarius (September 7), Saint Moses (June 16), Saint Anthony (August 7), Saint Hilarion (September 18), Saint Ambrose (June 27 and October 10), Saint Anatole the Elder (January 25), Saint Isaac I (August 22), Saint Joseph (May 9), Saint Barsanuphius (April 1), Saint Anatole the Younger (July 30), Saint Nectarius (April 29), Saint Nikon (June 25), and Saint Isaac II (December 26). The Hermitage of Optina (Optina Pustyn) is situated at the edge of deep forests in the district of Kaluga on the right bank of the River Zhizdra, some way from the town of Kozelsk (about eighty miles from Moscow). Throughout the nineteenth century and until the Bolshevik persecution, it was the focal point of a widespread movement of spiritual renewal, inspired by the hesychast tradition brought to Russia by disciples of Saint Paisius Velichkovsky (Nov. 15). The monastery, well-known since the sixteenth century, had fallen into ruin as a result of the anti-monastic laws of Catherine II. 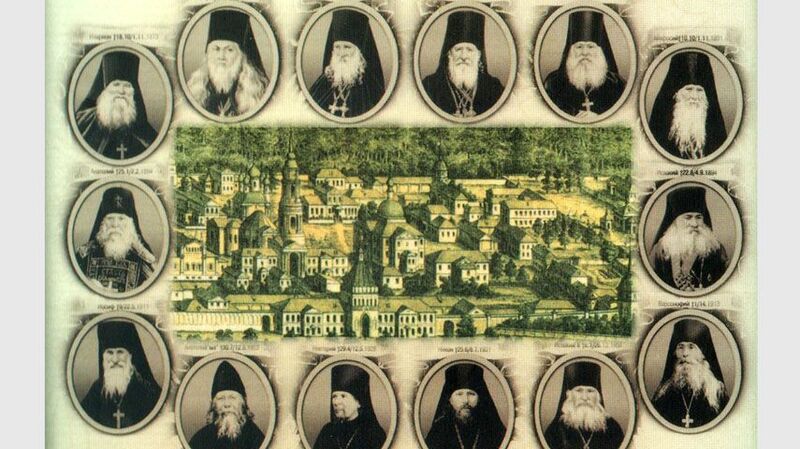 Towards the end of the eighteenth century, Metropolitan Platon of Moscow, impressed by the beauty of its location, gave Abbot Abraham of Pechnocha the task of restoring the monastic buildings and of reviving cenobitic life at Optina in the spiritual tradition promoted by Saint Paisius. About thirty years later (1821) Bishop Philaret of Kaluga, the future Metropolitan of Kiev, a fervent supporter of the Paisian ideal, undertook the building of the Skete of the Forerunner as a dependency of the monastery for those monks who wanted to devote themselves more completely to prayer. The Bishop called upon the brothers Moses and Anthony Putilof to direct the life of the skete. They had been living in the Roslavl forests in the region of Smolensk for ten years, under the direction of spiritual fathers from the circle of Paisius. Urged by the Bishop, Moses was ordained priest, and gave up his wish to devote himself to contemplation in order to take charge of the building works required. He was in Moscow, seeking funds, when he learned of his nomination as Abbot of the Monastery, the office that he fulfilled for thirty-seven years.